We were returning from an excursion to find some bok choi when a small, grey pickup slowed to a stop and a man wearing a bandanna Springstien style gave us a weary look. He asked in a thick French accent if we spoke German. We did not. We recognized this guy. He'd asked us the same question about a week before, to which Matt had responded, “Oh are you Fritz?” We'd read about Fritz, a German man who'd been living in Rikitea for years and made his washing machine available to people passing through on boats. And we were in desperate need of a laundry machine. Anyway. This time, instead of asking any questions we crawled into the bed of his pickup just in time for him to speed up the rest of the hill, round the corner at the top, and bounce onto a dirt road without so much as feathering the brake. But not in time to notice the gun he had stashed in the backseat. The big boxer mutt who was standing guard in the driveway just watched. Venturing out of town in Rikitea means going uphill, no matter which direction you head. 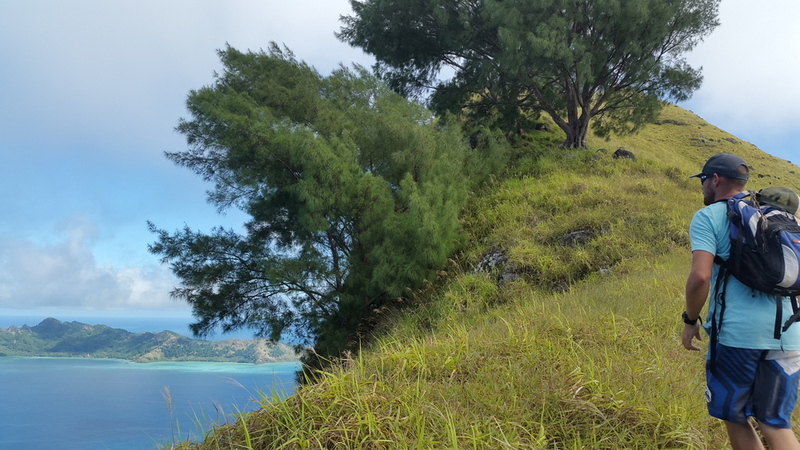 Rikitea is the main village on Mangareva, the largest island in the Gambier archipelago. These are the most remote of French Polynesia's islands. The weather station to which we'd followed the road sits perched on a flat lookout a third of the way up the mountain. On the day we'd arrived we'd been told by other sailors that there was a man here who grew bok choi, but all anyone knew was that he lived near the weather station. After a few halfhearted attempts and a lot of peering over fences, we'd finally stumbled upon a house in the shadow of Mangareva's highest peak, Mt. Duff, whose backyard was filled with rows of leafy greens and peppers. I'm usually the only one on the boat who gets excited about that kind of stuff (definitely the only one to use the term “leafy greens”), but after nearly three weeks at sea we were all feeling way past due for fresh vegetables. And finally finding it felt a bit like a bit of an achievement. For $10 we filled a plastic shopping bag full of bok choi, whole heads cut at the stem and dripping wet from being dunked in a five gallon bucket of fresh water. It was as we were cheerfully walking back down the hill from this successful mission that we bumped into Not Fritz. He steered the truck down a steep curved driveway at the end of the dirt road. Our destination was a simple house tucked into the corner of a hill overlooking Rikitea's harbor. Our boat looked teeny and far away from up there. All around the house there was evidence of ongoing projects: a garage filled with tools and scrap metal, spare tires stacked outside, tarps keeping piles of stuff under cover here and there. There were a teeny kitten and two small dogs there to greet us – not the kind of big mutts you saw lying around town, but rather what you'd refer to as specialty breeds; had they been groomed and deodorized, you might find them stowed away in some woman's purse somewhere far, far away from Mangareva. And plants grew everywhere. Some in containers, some in a makeshift greenhouse, some just this side of wild spilling out from under hibiscus trees or the edges of the patio. I spotted a few small tomatoes, a pepper plant, and a bunch of herbs and realized that this man hadn't brought us here to kidnap, kill or rob us. He wanted to feed us. Seeing us toting around a bag full of greens, he wanted to set us up with more fresh food straight from his own garden. He was already out of the truck and halfway into the forest behind his greenhouse when we came to this realization. We followed behind while the dogs scrambled around our ankles. Before long we were loaded up with an armful of starfruit and several heavy papayas. We still didn't know his name. He was one of those people who does what he's doing without distraction, delay, or even a smile. At that moment he was on a mission to collect food and that was all. Also, he seemed fixed on the idea that we didn't speak French or German and he didn't speak English, so even when I'd attempt to stumble through the awkwardness he'd dismiss it and continue marching toward some other part of his garden, me trailing behind. But I persisted, telling him that I worked on farms and in greenhouses. When I tried to ask him about his orchids he softened a bit and we could get along a half step above our very basic, mostly nonverbal form of communication. By the end of our short visit, the amount of fresh food we had in our possession had multiplied tenfold. In addition to our bok choi we carried bags full of little green bell peppers, bananas, starfruit, papaya, ginger, rosemary, Thai basil, and the thick, glossy leaves from a shrub he called bois d'Inde, or India wood (what I think was cardamom). We couldn't get him to take anything in return, Panamanian rum and fish we'd caught at Henderson Island being the only items of value we had for trading. He just laughed. “I have,” he told us, as if to remind us that there's not exactly a shortage of fish in the Gambiers. This wasn't our introduction to the kind of hospitality that French Polynesia is so famous for, but it is my favorite instance. There aren't many places where you can (or would) hop into a stranger's truck in a foreign country without speaking the language and without second thoughts as he whisks you away down a deeply quiet dirt road. And even fewer places where, after doing so, you'd end up not somewhere terrifyingly creepy, but instead in a mini-Eden on a tropical mountainside. We'd sailed through the wide gap in the barrier reef that surrounds the Gambier archipelago after 18 days at sea and two nights amid the solitude of Henderson Island. To us, the whole place was a miniature Eden. The pointy summits of Mt. Mokoto and Mt. Duff rise over 400m above the sea, which is nothing compared to the giants of the Marquesas and Tahiti but looked pretty magnificent to us. Mokoto and Duff are often hidden behind low passing clouds, and the rest of the island seems to have melted down from their peaks rather than risen up from below the sea. The vegetation is lush, deep green, and covers every fold in the land. From where we stared up at all of this on Tamata, the foreground was an electric blue sea separated from the shore by a splotchy border of pale turquoise. On land, there was the usual abundance of coconuts and plenty of banana and breadfruit trees. But also there were bright green pamplemouse – a sweeter version of the citrusy grapefruit I grew up eating – hanging from untended trees, mangoes ripening on shady branches, pumpkins swelling in ditches beside the road. The village bakery cranked out hundreds of baguettes each morning, as well as pain du chocolate and croissants on the weekends. There was a takeaway counter at one of the little shops (magasins) that served up steak frites and chow mein, plates that should rank alongside poisson cru as national dishes if not for the quality of the food, at least for their ubiquity on menus throughout French Polynesia. We settled in pretty quickly. I especially fell in love with the more temperate climate and self-sufficient, independent feel of the Gambiers. For us, most days in the village anchorage would go something like this: we'd wake up just before sunrise in order to make it to the bakery before the baguettes sold out, return to the boat for hot coffee and fresh bread, and then spend a few hours working around the boat. We'd usually head into town to do something around lunchtime, and spend the afternoon swimming and rotating our endless rotation of laundry. Sometimes we'd take long walks hoping to stumble upon the bok choi man. Most afternoons we'd make a few runs to the dock at the far end of town where there was a fresh water source. We'd paid $5 for what was essentially an endless supply so we wouldn't have to run the water maker. If you're planning on doing a month's worth of laundry in a five gallon bucket, you either need consistently rainy afternoons or a steady supply of fresh water. As it got close to 4 'clock the sun would grow weaker and sink lower, leaving us to finish up whatever work we had in the cool shadow of the south facing hillside for the rest of the afternoon. It was dark by six. Though the Gambiers are semi-tropical, they are situated at 23 degrees South. At that latitude, winter makes itself felt. One morning we hiked Mt. Mokoto, Mangareva's bald peak. Though it wasn't the most challenging hike, it was one of the best I've ever done. The end was a bit steep and completely above the tree line, leaving unobstructed views on either side of the narrow trail. One of those sides was a sloping, chartreuse meadow, the other a cliff. There were wild goats scampering around the rocks below us and way beyond them were miniature pearl shacks floating in a haze of blue. Such an incredible hike. When I think back on it now, it doesn't seem like we did a whole lot during our time in Rikitea. But just as on a boat, everyday chores in a remote place like the Gambiers take at least twice as long to accomplish as they normally would. Life slows down, each morning's “to do” list dissolves into a languid afternoon, and night sets in early. Our time there passed quickly.